What Types of Oral Surgery are Done and Why? Oral surgery is done in cases when surgical management is needed for the proper diagnosis and treatment of problems that affect the teeth, mouth, gums, jaws, neck, and the head. This specialisation can bring about improvements in both the functional and the aesthetic aspects, and can also be used to treat injuries and dental emergencies that need surgical attention. 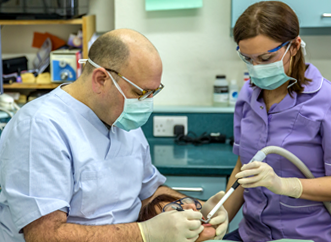 We carry out all kinds of tooth extractions, including the complex removal of wisdom teeth. We do frenectomies, gum surgery (treatment of gum disease), exposing unerupted teeth for complex orthodontic cases, and bone grafting prior to dental implant placement. We also do apicectomy and root resections. Tooth Extractions (including Wisdom Teeth) – We carry out all dental extractions at our clinic including complex wisdom teeth. A tooth extraction is done in cases when the affected tooth cannot be saved by other dental treatments, and will have to be removed to prevent the spread of further infection as well as to alleviate severe pain. Impacted Wisdom Tooth Removal – Wisdom teeth are the last teeth to erupt into your mouth. They come through in the late teens or even later. Quite often there isn’t enough room for them and this can cause problems like persistent gum infections. An impacted wisdom tooth is one that has not grown out from under the gum line. In this case, the tooth will start to push against the surrounding teeth, causing extreme pain. Since the tooth did not erupt fully from under the gum line and cannot be cleaned properly, it can easily develop tooth decay which leads to more complications and more discomfort. To get to this impacted tooth, a surgical incision will be made on the gums to facilitate the successful tooth extraction. Gum Surgery – Gum surgery is done when other non-surgical treatments are not enough to address complicated gum problems. The surgical procedure may be done to reduce gum pockets caused by gum disease, for gum tissue grafts, and to regenerate the gum tissue that has been affected by severe gum disease. Frenaectomy – A frenaectomy is the removal of the frenum or frenulum, which is a thin band of tissue found under the middle of the upper lip, and under the tongue. This surgical procedure is done in cases when the position of the frenum makes it difficult for normal development and function of the lips (and the tongue). A frenectomy improves tooth development, normal speech, and can also be used as a preparation for a dentures treatment. Apicectomy – This oral surgery procedure involves the removal of the tip of the tooth root, and is usually done when a root canal treatment does not successfully remove the infection in the area. Infected tissue is removed as well during an apicectomy, so that further pain and discomfort will not be experienced anymore.